The BMW story starts way back in 1913 with the formation of the Rapp-Motorenwerke company by Karl Rapp. The firm were engaged in the production of aircraft engines from a former bicycle factory located near Munich. It was close to this plant that Gustav Otto established the Bayerische Flugzeugwerke AG aircraft factory and in 1922 these two organisations merged to form BMW. The letters stand for: Bayerische Motoren Werke. In their early years BMW produced mainly aircraft engines, but also some motorcycle engines. In fact the BMW badge is supposed to resemble a spinning aircraft propeller. It wasn’t until 1928 when BMW bought a car factory at Eisenach/Thuringia that BMW began producing cars. Along with the factory they bought the licence to produce a small car called the Dixi. 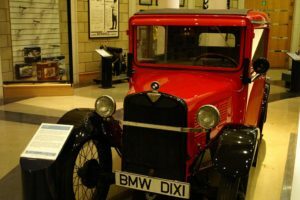 The first cars produced by BMW at the plant were badged BMW Dixi, but the word Dixi was soon dropped. 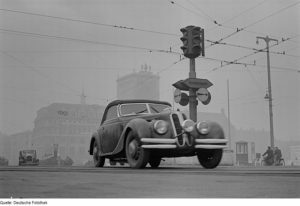 They introduced a new model called the BMW 3/15 DA-2 and the success of this car enabled them to survive the great depression. BMW’s involvement in aircraft engine production during WWII led to a 3 year ban on production at the end of the war. It wasn’t until 1949 that they were able to return to production which they did with the 250cc R24 motorcycle. It was in 1951 that BMW introduced a spacious, 6-cylinder sedan called the 501. This was followed by the 502 which featured a lightweight alloy V8 engine. Later in the 1950s they began producing the BMW 507, a lightweight, V8 propelled sports car. This was the vehicle they hoped would revive the sporting success they’d achieved with the 328 roadster. But this wasn’t to be. They were losing money on every 507 that was produced and so production stopped in 1960. 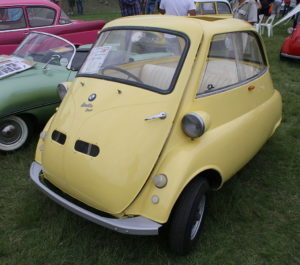 Also during the 1950s BMW bought the design and manufacturing rights to the Isetta which was to become one of the most successful microcars in the post WWII years. It was a time when cheap, short distance transportation was much needed and the 2-seater, with an economical 250cc engine, fit the requirements nicely. Manufacturing rights for the Isetta were sold to various production companies around the world and these included the British Railways works in Brighton, UK. The 1960s saw BMW enjoying a number of notable successes including the BMW 1500 which was a 1499cc, four cylinder touring sedan introduced in 1961. This was the first of the modern BMW sports sedans. They went on to produce a series of popular sedans including the famous BMW 2002. This was a 2-door sedan that had been based upon the 4-door 1600. The 2002 was to be the forerunner of the BMW 3 series and production of this successful model continued until 1976. 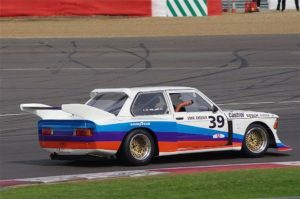 By the 1970s BMW had cemented their reputation as an innovative automobile manufacturing company. The 70s saw the introduction of the 3-tier sports sedan range consisting of the 3-series, 5-series and the 7-series. Between 1970 and 1993 BMW car production quadrupled and turnover increased by 1700%. The 1990s, after 1994, saw BMW take ownership of the British Rover Group. This was not a successful venture and in 2000 BMW disposed of Rover. Today’s ‘beemers’ have retained their highly prestigious reputation for quality and reliability.The company are taking steps to reduce the impact they and their motor cars have upon the environment so we can expect to see more innovative and exciting developments from the motor car company who have not only survived two world wars and a massive depression, but thrived. 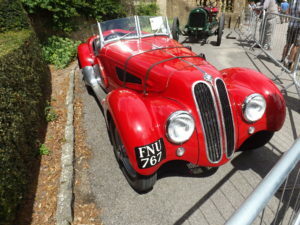 1928 bmw dixi, 1936 bmw 328, 1951 bmw 501, 1956 bmw isetta 300, 1977 bmw 320i gr5, Bayerische Motoren Werke.